The National Health Care Soap Opera Hits a Curtain–Intermission or Climax? After a year of deals, compromises, debates, broken promises, lies, protests, counterprotests, Health Care Reform(?) is passed. With all the incredible rancor and venom, Nancy Pelosi and Harry Reid have to be congratulated for actually getting SOMETHING done. There are about 32 million people who will have them to thank for actually having some kind of health care, and countless others who will not be denied coverage for “pre-existing conditions” or other BS. Is it a perfect bill? Hell, it may not even be all that GOOD a bill. It strengthens the stranglehold of the health insurance industry–that mandate for all citizens to buy health insurance can be seen as nothing less than a bribe to get the parasites to give up denial of coverage and if anyone thinks that the insurers are going to keep rates down and risk lowering executive salaries and bonuses, I’ve still got that bridge in Brooklyn I’m offering on eBay. But let us be generous and think of it as a first step in what is likely to be an arduous journey. Real Reform for the rest of us lies further ahead. Let us be thankful for the people who won’t be forced to die for lack of medical care. You would think the votes wouldn’t be so close. But all you have to do is look at the demonstrations over the weekend to see the bitterness that poisoned the hope of better legislation. 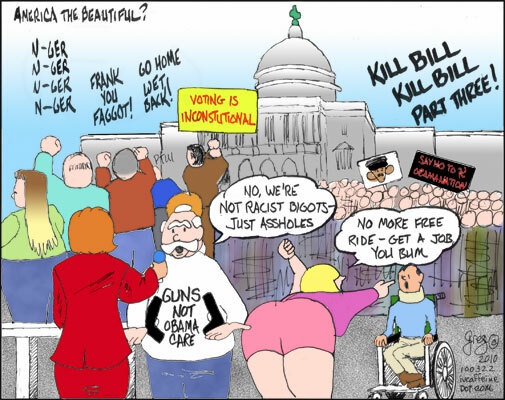 Teabaggers running through the House offices, banging on doors and shouting. Hurling racial and other insults at Representatives as they prepared to vote. Spitting on them. One person in a wheelchair was mocked and told his “free ride” was over. It wasn’t because of the sweeping nature of the plan. It kept to guidelines established by Republicans decades ago. This bitterness arose because some people in the US could not abide the thought of a black President and wanted to do anything in their power to destroy his tenure in office. They were whipped into a fury by Fox News and demagogues like Rush Limbaugh. Responsible Republican leadership has been out to lunch. They excuse this behavior instead of telling the teabaggers to stop acting like children. And they did this because the teabaggers were pulling the stunts they themselves knew they couldn’t get away with. Finally, after the vote, Boehner told everyone to start acting like adults. But the genie’s out of the bottle. This is not the end of the teabaggers, I betcha. I hate to see what will happen next.